Anti-government protesters in Tahrir Square February 10, one day before President Mubarak resigned. Photo by Getty. Egyptians are still positive about the country’s future but uncertain of the prospects for free and fair elections, according to a new poll released Monday, taken nearly two months after former president Hosni Mubarak stepped down. They remain negative about both their 1979 peace treaty with Israel and about the United States. 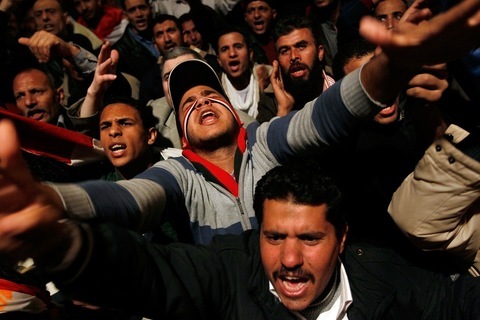 Of the 1,000 Egyptians polled March 24 to April 7 for the Pew Research Center Global Attitudes project, 65 percent say they are satisfied with the way things are going in the country, up from 28 percent in 2010, and 57 percent are optimistic about the future. While an overwhelming majority — 77 percent — say Mubarak resigning was a good thing, only 41 percent say it is very likely the next election will be free and fair. A less confident 43 percent said the prospect is somewhat likely. Overall support for democracy remains high, at 71 percent, up from 60 percent in 2010. The military is in very good standing with the people, according to the poll, with 88 percent rating it as a good influence in the country, higher than any other institution. Military chief Mohamed Tantawi is rated favorably by 90 percent of respondents, above other leadership figures, including former IAEA head Mohamed ElBaradei, and just higher than Amr Moussa, current head of the Arab League. The relatively secular April 6 youth movement and the Muslim Brotherhood are both broadly popular as well. Shibley Telhami, the Anwar Sadat Professor for Peace and Development at the University of Maryland, College Park, who was not involved in the poll, points to the changing political landscape as the root of this uncertainty. “A lot of the young people behind the revolution and a lot of the people supporting them are probably not particularly happy with any of the parties, and there are new parties that are forming now and just starting up,” he said. The challenge for these parties will be to build support and name recognition in a short period of time before elections are held. The majority of Egyptians would also like to see the country’s decades-old peace agreement with Israel annulled, by a margin of 54 to 36 percent. Kohut said that finding was not surprising, given there was no real public support for the treaty when it was signed in 1979. “It’s a long-standing treaty, but more than 90 percent of Egyptians have a negative opinion of Jews, [and] 80 percent of Egyptians think it’s hard to see Israel coexisting with equal rights for the Palestinian people,” he said. Telhami said the results coincide with what he’s seen in the country in recent years. The poll revealed a range of attitudes towards religion, with religious leaders rated as a good influence on the country by 81 percent of those polled, but Pew notes that only 29 percent of respondents gave “very good” ratings for religious leaders this year, while 43 percent did in 2007. Respondents were split in their views on Islamic fundamentalists, with about 31 percent sympathizing with the groups, 30 percent sympathizing with those that disagree with fundamentalists, and nearly 40 percent not choosing a side. Just 36 percent say that rights for Coptic Christians and other religious minorities are a “very important” priority. Kohut pointed to those results, and the fact that 62 percent of respondents said laws should follow the teachings of the Quran, as evidence of the diverse attitudes towards religion in the country. Attitudes towards the United States remain less than warm — only 20 percent have a favorable opinion of the United States, slightly higher than the 17 percent last year, and only 22 percent thought the U.S. had a positive impact on the political situation in Egypt, while 39 percent thought the impact was negative. President Obama’s response to the shifting political winds in the Middle East failed to win over a majority of Egyptians: 45 percent approve of his response, 52 percent disapprove. Corruption, lack of democracy and lack of economic prosperity have all weighed heavily on Egyptians in recent years, the survey found. Improving economic conditions rated as a very important priority for Egypt going forward by 82 percent of respondents, just above forming a fair judicial system, and well above honest elections, which were prioritized by 55 percent of respondents. Women’s rights and religious freedom for minorities are considered very important by 39 and 36 percent of the polling pool, respectively.